Bramble Berry Orders: Behind the Scenes! We often hear that coming home to a Bramble Berry box has the excitement of Christmas morning! So we thought you might like a glimpse of what the merry ‘elves’ here at Bramble Berry do to get you your order. Here’s the play by play from placing your order to receiving your order for an exclusive behind-the-scenes peek into the Bramble Berry warehouse! The first step starts with you, our valued customers (we wouldn’t be here with out you!). Orders can be placed online on Bramble Berry’s website using our easy to use online shopping cart. If you prefer to place your orders over the phone give us a call at 1.877.627.7883. (Meet the Customer Service Team) The BB customer service team loves talking all things soap related and taking orders! Once your order has been placed, you will receive an email confirmation. Did you know that you can make changes to your order within one hour of placing it? Just send us an email to orderchange(at)brambleberry(dot)com within one hour of placing your order or notify us by writing a note on your order. 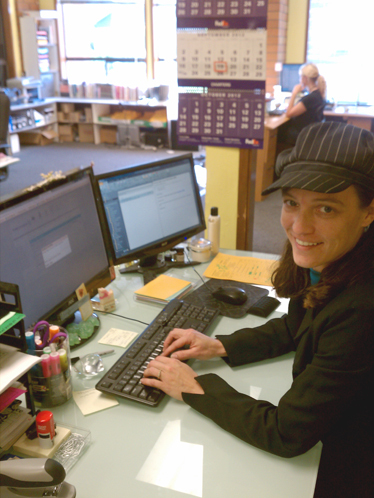 Meet Carla: Once your order has been placed, our lovely Order Releaser, from the customer service team, checks the payment, address and shipping on the order. If everything looks good then the order gets printed and sent to the warehouse. Meet DJ: Did you know that all your fragrance and essential oils are hand-poured? 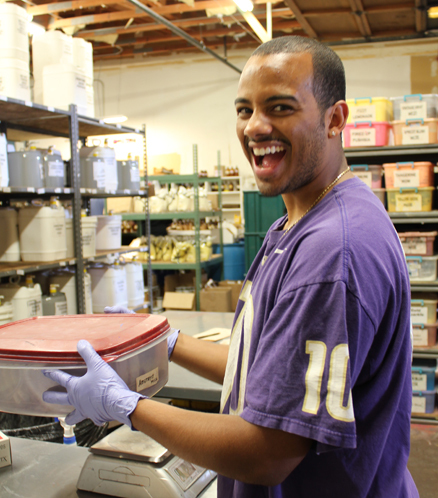 Even your butters, soaps, and colorants are all hand packed and picked by our warehouse team. 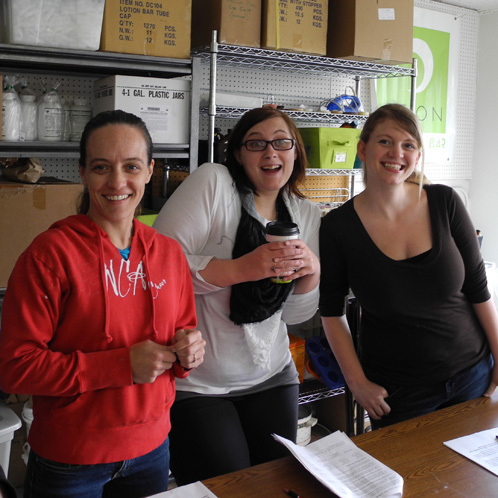 It’s a labor-intensive process but our warehouse crew is the best in town! 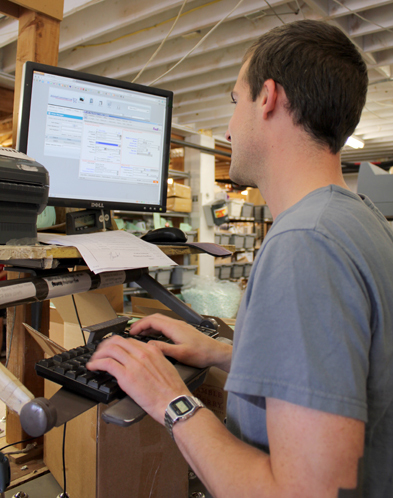 Your order then moves around the different sections of the warehouse depending on what you’ve ordered. A typical order will bounce between different departments: Fixed Oils and Butters, Fragrance and Essential Oils, Colorants and Herbs, Soap Bases, Molds and Tools. “Your items are being gathered and carefully packed” order status means we’re running around the warehouse “pulling” everything that you ordered! Meet Viet: Once your order has been pulled it is taken over to the packing area where we carefully double check the order to make sure all the items that you purchased are present. Then our packers carefully package up your items with our packing foam. Before we tape up the box we sneak in a 1/2 oz. fragrance oil sample (YAY). Meet Mark: After your order has been packed, your payment is captured then sent to our loading docks for FedEx or USPS to pick up. Fun Fact: Did you know that we ship anywhere from 300-400 boxes per day? Meet John: Once your order has been picked up from the Bramble Berry Warehouse it’s on it’s way to you! You can use the tracking number (found in your shipping confirmation e-mail) to follow your package until it reaches its final destination. Do you have any questions about our polices? Check out Bramble Berry’s store and shipping policies here. A big thank you to our Bramble Berry customers for your orders and support. I live in Ontario Canada and pick up my order on the US side of the border and from the time I place my order to receiving it is only a matter of a few days! I have started my own new soap/spa product adventure.I was giving a few samples of things that i have made to friends at work.I live in a small town in minnesota,well people started getting curous about what i was doing.Soon i was making and selling (legaly of course)it has not taken me to long to figuer out that my little town was in need.So jumped in head first.Made all kinds of mistakes,but brambleberry has been my biggest supplier for almost everything.Thank you for everything and yes it is christmas with every order.A friend comes over with every new scent.We have so much fun!!! We are so happy to hear that your business is going so well, Dixie! Hearing personal stories from our customers makes us even more determined to provide you with the best products and customer service available. Thanks for the sweet words, Dedre! I loved this look behing the scenes at BB. I had no idea you shipped 300-400 pkgs per day. Wow! Thanks for the fun peek behind the scenes at the BB warehouse! It is neat seeing the process. It’s also nice to put some names with faces! Keep up the awesome work! Just received my first soap order yesterday and was so excited. (It did feel like Christmas!) I was amazed at the packing foam and how great everything was packaged. Great job, everyone! Your hard work is truly appreciated. I can’t wait to get started with my first ever soap making. It’s been a long time coming and you guys have made the experience so far very enjoyable. Wow, 300-400 boxes a day, that’s crazy!! Thanks for all that you do BB team, I appreciate you all so very much! I made my first order with brambleberry just a few weeks ago and loved the customer service! Nice to put faces with the service, WAY TO GO GIRLS! I thank you for the behind scenes at Brambleberry, they do such an excellent job. I like to put faces to the people who so carefully, quickly and thoughtfully have sent me my much anticipated packages. I have received orders from other vendors that took forever to get to me, were sloppily packaged, leaking and generally haphazard. Please let your guys know just how much their hard work is appreciated. When I receive a package from Brambleberry it is always right and is always an exciting event. Thank your staff and thank you for caring enough to employ such a good group. That was a lot of fun to read! I love “behind the scenes” of anything…bonus that it was the awesome Brambleberry team! And today three boxes arrived safely in the Netherlands! Thank you BB warehouse team! Thanks for the peek behind-the scenes! The packing foam does a great job of protecting my order during shipping – but is there any way I can reuse/recycle it? I hate to throw it away! You can actually box it up and send it to a central recycling location (you can call your local recycling center to find out where to send it) and it will be recycled as that fabric that lines the inside of your car trunk. If you live in Europe, you can recycle it curbside. I hope this helps! I just received my order from you yesterday, so this is fun to see its process! Thanks! Thank you so much for your order, Susan! Looking good! Thanks for the behind the scenes peek! I’ve always tried to imagine what the “behind the scenes” looks like and now I know – thank you! It is so helpful (and cool!) to see all the people that work together to make your shop the best in class and my experience an outstanding one. The packing foam has always fascinated me – what an interesting and effective packing method. It’s fun to see the machine that creates it. And WOW – 300-400 boxes a day – you guys are rockin’ it! Congrats and thank you for all you do! Thanks for the peek into your warehouse! It’s interesting to see what goes on from the time we order to the time our order ships. Wow! 300-400 boxes a day is a lot of soapy fun!! Whoooo Hoooooo My order will arrive on Monday (24th) and I’m so excited! I’ve ordered in the past but I’m getting some new soap colorants (mica’s and pigments) as well as the vertical mold. I absolutely can’t wait to try that mold out! A gal on my soap forum uses it and loves it and your blog tutorials put me over the edge to finally order it. I’ve been drooling over it for some time. Thank you so much for your order, Krissy! We are so excited to see how your soaps come out. You’ll have to share pictures with us if you get any. 🙂 Happy Soaping!